While a new, perfectly crisp pair of denim is fine and dandy, there’s a little corner of your heart of which only your most tried and true blue jeans can fill. The insides have rubbed soft from repeated wear; they’re tight in all the right places but have given you a little more room to breathe in others; you may have even worn a few holes in the back pocket from shoving your wallet in there. These jeans have become a part of your life, and you’ve had a visible impact on theirs as well. Now, you may be thinking in horror, “is she endorsing the male counterpart to the mom jean? !” No, I’m not. The key to keeping the lighter, faded look out of dad jean territory is a slimmer fit, and we’ve found just that. Yes, a clean, dark, stiff denim is always – ALWAYS – going to look more elevated, but sometimes you want to look casual, and a slim-fitting, washed-out pair of jeans will seamlessly fit into every outfit built around your favorite selvedge pair, but with a whole ‘nother vibe. There can be elegance in the ease of a perfectly worn pair of jeans. No pant will ever look nor feel as effortlessly casual cool as a lived in, washed out pair of jeans. Wear it well: Keep things casual, but not sloppy, for a first date in a henley and blazer, both unbuttoned. Push up the sleeves and roll the pant legs once or twice. Wear it well: April brings showers, but it’s also kind of sunny, and sometimes at the same time? Be the guy who looks great in sun showers. Wear it well: Muck up your jeans with muddy brown and khaki accessories, not actual mud. Wear it well: Dad style done right – all the classics, in a slimmer silhouette. Wear it well: Keep the denim on denim look sharp, not suit-like, by mixing your washed and worn with stiff and dark. Take it a step further with brightly patterned accessories. Want to see more ways to wear the items featured in this article? 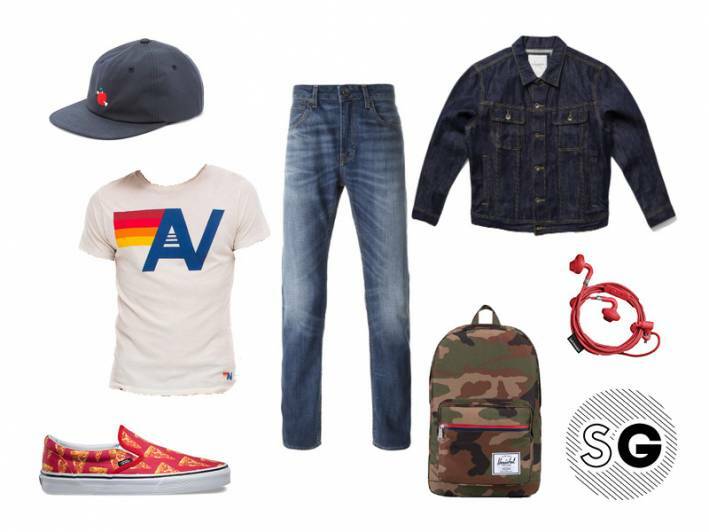 See 5 ways to wear a graphic tee, statement bomber and penny loafers,.